Grab a book and a pledge sheet to help raise funds for the SES PTSA! 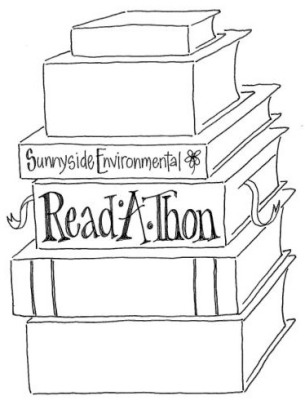 Sunnyside’s annual Read-A-Thon began January 26 and runs through Monday, February 8. Pledge sheets and reading logs, along with more information, came home with students. You can also find the reading log online here. If you prefer to log your pledge online, visit this page. There are great prizes for the students who read the most units, and for the individuals and classes that raise the most money. The Read-A-Thon has become a primary means to raise money for the PTSA’s general fund, which provides for special programs and allows all students to participate in music, art and school trips. Grades K-2, 3-5 and 6-8 will participate against each other in a “house cup” contest to see which house earns the most reading units. Ask your kiddos if they got caught reading. Dress like your favorite character day is Friday, January 29. Read-ins are scheduled during students’ lunch times on February 1-3. The after school read-in will take place Friday, February 5. We look forward to a great couple of weeks when we can all curl up with a good book and raise money for this school’s exceptional programs. Please contact Heather Dury at heather.dury@gmail if you are available to help.